HOLLYWOOD, Calif. --- Mere days after famed martial arts action movie star Chuck Norris announced his conversion to Seventh-day Adventism, vegetarianism has spread like wildfire as the diet of choice around the world. The World Health Organization (WHO) reports that due to Norris's new convictions and now vegetarian lifestyle, a meatless diet has been adopted by billions of people "of every nation, kindred and tribe." WHO spokesperson Raundause Cihk said that the diet revolution sparked by Norris was unlike any other ever recorded. "There doesn't seem to be a soul on the planet that isn't going veggie crazy right now," said Cihk. "Some might call this a fad but knowing Chuck Norris, we're pretty sure this is a seismic shift." Is this the same Church Norris made famous as a Texas Ranger? This is great PR for the health message. I believe he does infomercials on health products. This is neat. Great! Astounding! Miraculous! Like the farmer-outstanding in his field. Can’t wait to see what’s coming down the BA pike next!! My brain is getting exhausted. Will Norris be connected with Loma Linda? Could he be a poster boy for the next GC in Indianapolis? Woe iz me!! CHUCK IS ONE BAD BUTTOCKS DUDE. HE CAN TURN ANYONES CHEEK WITH A ROUNDHOUSE KICK. This “news” is not just a tall tale, it is a total fabrication, deceit, dishonesty, misinformation, falsehood, fiction, forgery, misrepresentation, myth, perjury, and slander. Many of the suckers who read it don’t realize that the so-called “humor and satire” is just a blatant lie. You’re causing confusion and spreading deception. Time to look for an honest way to make a living. Yes, I agree. Did chuck norris really convert? If not, you need to take down this lie. Lighten up. This is satire. Take it down about ten notches. I am a perfect predictor of the future. Some would call me a prophetess. ‍ ‍ ‍ • ‍ Hillary Clinton will say something dubious or insincere tomorrow. ‍ ‍ ‍ • ‍ BarelyAdventist will post something clever or witty tomorrow. At the end of the day you too will become Adventist! The Seventh-Day Sabbath is the Day of the Lord! Period. And inspiring worship music will appear on http://www.YouTubePraise.com — just watch and see if I’m not right! I don’t see the need of joining the Adventist group, it is a waste of time for it is secular. But instead let the Holy Spirit whom Christ had promised us during His ascension, that is a sure way of going to heaven! On food issues, let’s leave to nutritionists, it is their work!’ They should tell us what to eat and not eat. I am offended by this comment. The SDA church has not kept us with Functional Healing Medicine but has followed the world. Healing true healing does not include so much sugar, and desserts at pot lucks. And gluten is very bad for so many people. And this has to be somekind of a joke? And putting down a good man and joking about him is beyond unkind. I was wondering it this was not a satire site? Have any of you actually met Dr Carson? Or his wife? Have you ever heard Donald Trump speak in person? Or have you read all of Dr Carson’s books? Guess I was taught to be kind. Learn about Functional Medicine Nutritional Therapy, God made our bodies to heal. And chemo and all of the drugs and vax shots are killing us. Lighten up. It’s satire. People that don’t get it provide more humor than was originally intended. Wow. Beautiful song; wonderful, worshipful rendition! Pure praise – awesome. Glad I listened to the end. Love it. Amen, the Lord is worthy to be praised. May He bless this young group for dedicating their talents to Him. Excellent and true worship. Praise God! Richard Mills, this is an Adventist spoof site. It isn’t real. Richard’s comments are actually more real than you can imagine. I get a kick out of seeing how many misguided souls think this site is not real. Yes, Justin, it is real. It is as real as the Internet itself, invented by Al Gore. It exists as certainly as love and generosity and devotion exist. Alas! how dreary would be the world if there were no BarelyAdventist! It would be as dreary as if there were no Justins. There would be no humor, no poetry, no romance to make tolerable this existence. So yes, Justin, it is real. Barely Adventist, where this article was published, is a satire blog. There’s no truth in anything here. Don’t get too excited. I think Albert was making a play on words. Too bad Chuck Norris did not run for President instead of Ben Carson. We would surely have the first Adventist president. I can still be VP. There are two Donald Trumps, and there are two Ben Carsons. Let’s hope that Chuck was turned on to the Little Debbies part of the health message, too. No health message is complete without a daily dose of vegetarian Little Debbie’s snack cakes that are full of sugar, brimming with fat, packed with empty calories, and overflowing with sodium. Just ask my sister, a former 98-pound weakling. She’s still trying to figure out how she gained 285 pounds after adopting the Little Debbie’s health diet. She’s certainly doing something right! I know the vegetarianism thing is not real… but did Chuck Norris converted to Adventism? No, he’s a longtime Baptist and continues to be. LONG TIME BAPTIST IS A BRANCH OF SOUTHERN BAPTIST. Thank you Justin. Barely Adventist needs to steer away from such foolishness as saying people becoming Adventist. Last time I checked, that was called a lie. Not even funny. It’s amazing GOD’S ways are not man’s way, everyone has a destinted purpose in this world. Thank GOD for his soul! Wow…such hostility. Sounds just like Christ in Matthew 5. LOL! Ha ha! LMBO! ROFL! You cracked me up! My dear friends, there isn’t a soul that God did not create and there isn’t a soul that God can not win. We all try to preach the message and God does the winning and converting of souls. He can win even the worst. If you think this is a lie, it will happen someday to someone you really know. But am sure it can happen to you if you have never got converted for real. Surprising to the known world…yet amazing for insolent to believe… Even me now, it deepen my trust in Gods way to led people to the truth. If concersion is real lifestyle is real.. Chuck you did an excellent chiode for Gods honor and glory from an honest heart. This isn’t true. It’s a spoof site. 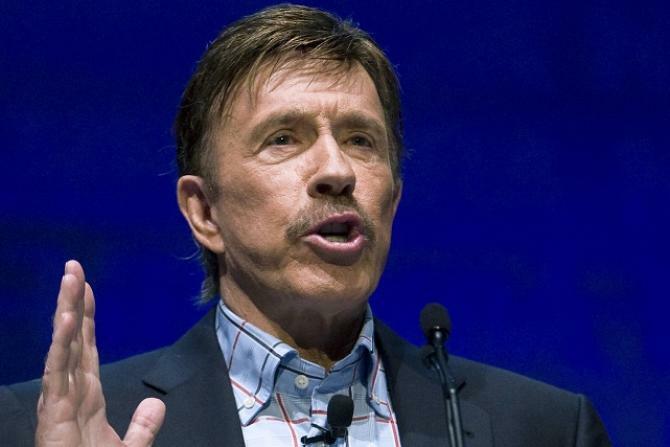 Chuck Norris would not like to become President but he will reign with Christ as King nstead for a thousand years soon! WHO ELSE WILL BE SAVED FEDERICO? The Four Horsemen of the Apocalypse check their closets every night for Chuck Norris. thats a good step Mr. Norris, you are welcome to the remnant church of God. Please to what you have believed. Sheesh…it really says something about Adventism that you all actually believe this. ALL CHRISTIANS WHO AWAIT ON THE LORD WILL BE THE REMNANT. THANK GOD ITS NOT LIMITED TO GROUPS AND DIVISIONS FROM THE EARLY CHURCH TO NOW. Interesting that Adventism is equated to vegetarianism. There is nothing about loving God or preparing for the second coming. There is so much more to be Adventist than just being a vegetarian. Its messages like this that leads to Adventists being misunderstood. I know that there are Adventists that are not vegetarians. Is this a fact my brother? I knew Chuck Norris as a Christian, but is the news about his converting to Adventism true? Has he really become a vegetarian? No. This is a parody site bent on getting Internet hits and causing drama. Also known as FAKE NEWS. This was the original fake news site. In God we Trust! Amen. God is not dictated on how to do His work! Glory be to Him! Amen! Amen; you’re right, Priscianel C. Romaga. Glory be to Him !. i believe that one day even jay zee, beyonce, lil wyne, etc ,….shall surrender their souls to the Lord. even Hillary and Bill – They surely need the Lord now! AMEN AND AMEN! !… GLORY BE TO OUR LORD JESUS…. This is amazing,! Vegetarianism is also part of signs of sincere conversion for the Remnants.. It is so easy to fool the Remnant. Chuck Noris has taken right stand with the true christian life taught by Seventh day Adventist. – more and more people will join seventh Day Adventist,if they are serious about God and heathful living. perfect Norris; I´m verry hapy for you because you take a perfect desision! Chuck you did the right decision in life. Thank you God for bringing your children in the sheeves. It’s truly God’s perfect plan to bring Chuck to the right path who truly obeys and do the will of God.He is touched by the Holy Spirit as well to save his soul so that others will be enlighten through Him.And by the grace of God he is saved and through his faith and not of himself. May the Lord God bless you always! ” Blessed are the poor/fool in spirit for they shall see God ” My worst enemy is myself, I wanted to be a vegetarian but although my spirit is willing, my flesh is weak.. I envied people like Chuck, Norris for being so brave to conquer himself. I felt sorry for myself and Just-In – Singling to show envy to people like the Adventist and Chuck Norris. That makes the two of us Just-in. We may learn how to conquer ourselves. I know that I’m going to hell. Why? Because Paul the Epistle said it is better to burn than to marry. Why does a website of this nature exist? If they claim to be Seventh Day Adventist, the conference should ask them to close it down. This is embarrasing for serious Adventist. They make our religion look like a group of clowns. Seriously. My mom & dad are SDA in Denmark. …..reading all your comments above makes me happy that I am not. This site is funny and I love it. Alright … you can persecute us now… we have Chuck Norris on our side!!! Taking it too seriously? Hmmm. Satire is satire. Some of us actually get that. Never commented about barely adventist before, but i’m clealy not a fan. Go for it. Have a laugh. But, Joking about someone converting to the Seventh-day Adventist faith . . . when they didnt? Must have been a low volume inspiration day. Should have passed on the idea of fake conversion. And yes i knew it wasn’t true as soon as I saw barely Adventist. This one isnt even barely funny. Hehe… Thanks to all you “balanced” folks who understand humour and the health benefits gained from laughter. Thanks also to you nutters who made me laugh with all your overwhelmingly serious comments. However, I would urge you all to go back and read scripture, definitely not forsaking humour in the process, and see what it tells us about times when we think a brother has gone astray. It says to go to him first, then if he won’t listen, go again with another to support you, and only then take the matter to the church, and so on, but only if he continues on the negative path. God’s children are not to post private counsels to one another on public forums, where the above steps are not possible to be followed. In such times, silence is golden! To all you folks reading who actually made it this far down the comments, if you are getting what seems like a clear picture of what Christians are like, please don’t judge God or His beautiful word based on the comments you read here. You’d be selling Him and yourself short if you didn’t go back and read the Bible for yourself. Once again to the believers, it is a disgrace to God when the order of counselling a brother is not adhered to, and especially on forums like these, it becomes a direct violation of the third commandment, using God’s name – the name of Christ/ianity – in vain, posting such comments on a site where non-believers might read just how divided God’s “professed” children are. God doesn’t intend for us to be divided, quite the opposite actually, but if we cannot agree on one point or another, it is not something we publish publically, signing off as Brother Christian, Sister Believer, and especially Remenant SDA, which only tarnishes God’s glorious name and damages His work among those who would judge Him based on what they see in us. Oh if you only took more seriously the responsibility of being Christ’s representatives, you would think twice before “counselling” one another openly and publically. Better that you remember how gentle and sensitive Jesus was, writing to the accusers with His finger in the sand, private messages, convicting counsels, but all in the dust where it could be blown away to be kept private forever. Don’t shame anyone publically, nor counsel them, “sincerely” or otherwise, as this is not God’s way. My humble appeal to anyone who isn’t a Bible reader yet, is to not allow people’s comments here to deter you from reading such an amazing book, or meeting its wonderful Author – who I’m sure understands good humour.